Young John Connor really enjoyed the Star Wars movies. His mother, Sarah, allowed him this escape knowing full well the terribly difficult future that awaited her son. She was also very generous in helping John to amass one of the greatest collections of Star Wars action figures, vehicles, and play sets that any kid could ever hope to own. For all that generosity, however, there was something conspicuously missing from young John’s collection. John Connor had never owned a Boba Fett action figure of any kind! “You’re welcome, John, I want you to enjoy your childhood as best you can before the machine apocalypse,” she replied. “And I thank you graciously for that, mother, but why do you never buy me any Boba Fett toys? I so wish I had some of those too,” John exclaimed. Sarah pointed towards the Play-Doh and the Legos, but John did not understand. “I will never buy you such a toy, John, you should know that by now,” she added. “But, why, mom?” he asked. “Because, John… you have all that you need right here,” assured Sarah. Still confused, John looked around… and his mother could see that he had not yet learned the most valuable lesson of all… “If you want a Boba Fett toy, John, you will have to create one from the other toys I have given to you,” she commanded. “I don’t understand,” John replied. “There is no Fett but the one you make for yourself,” said Sarah. Way back in the ancient 1990s… there was a comics fanzine called Vantage Comics and Card Picks. As you might surmise from the title, they talked about comics and trading cards! 🙂 There were others too, like Wizard and Hero… but specific to this blog post, there was Vantage. My memory is foggy at this point, but at some point way back in the day they had a job opening. I can’t remember if they were looking for someone to do page layouts or creative writing, or perhaps both… but I worked up a couple of full-page samples of funny to submit to them. I don’t remember ever hearing anything back from them, and that fanzine is long gone… but I recently found my old samples again and scanned them in so that I could share them on the blog. 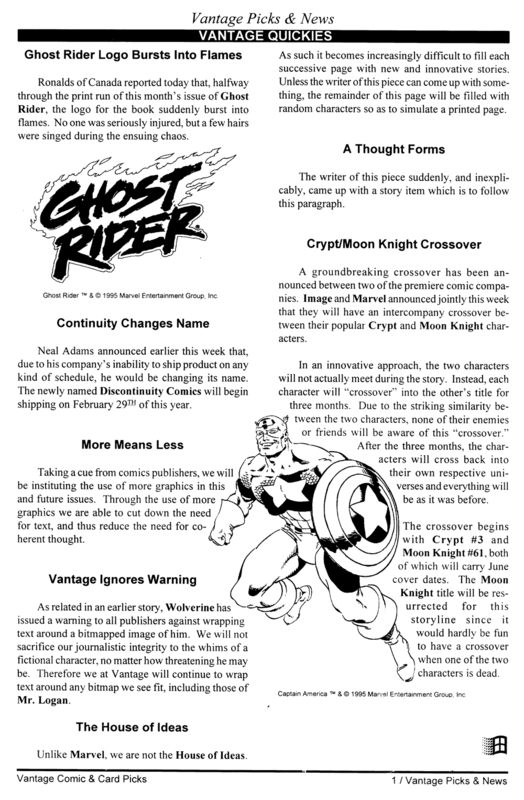 Some of the jokes still hold up, even if you might not get exactly the reason why I made them… probably the most obscure one is the Crypt/Moon Knight non-crossover joke, which basically pokes at the notion around that time that some characters at some companies were virtually indistinguishable from characters at other companies 😉 I also like the fact that the picture of Captain America is literally there for no real reason… I mean, nothing on either page makes any reference at all to him! This is 20+ year old stuff from me, but I think my sense of humor is pretty much still in the same general place, so let me know what you think. 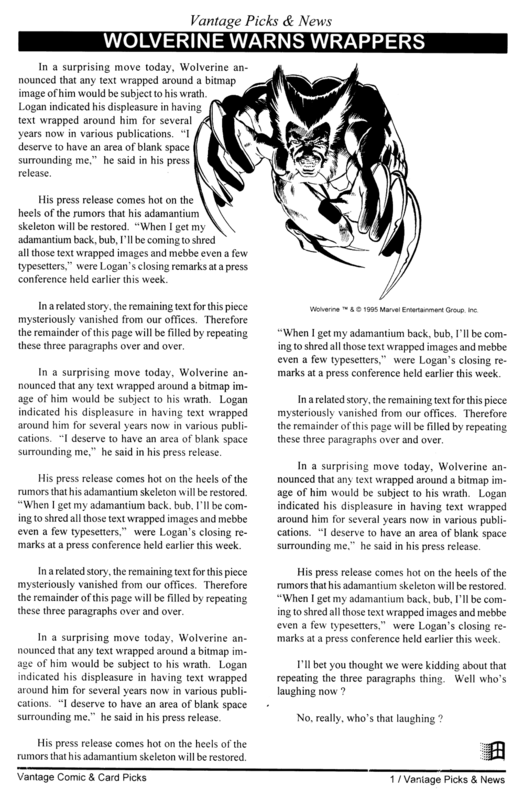 Also, I kind of miss fanzines like we had back in the 1990s. We don’t really have that today. Sure, there are some Web sites, but it’s just not the same as a monthly magazine that you can hold in your hand. Zeus was angrier than he could ever before remember being… so angry that he was involuntarily shooting lightning bolts from his ears as he stomped across Mount Olympus on his way home from work. The humans this day had so dared to defy him that he could barely compose himself to do what he knew must be done. We are sorry to have missed you today, but we must inform you that your lease on our property expired two weeks ago. As per the terms of your original agreement, we have repossessed the Kraken. You do not owe us any further payment at this time. If we may be of service to you in the future, please feel free to contact our offices. Zeus let out a sigh, knowing this day his anger would have to be quashed as he had known this day was coming but he had inadvertently forgotten to leave word with his receptionist to complete the necessary paperwork in order to maintain his possession of the Kraken. Calmly, he entered his residence and picked up the phone to call his office. I boarded the plane as usual and took my seat. Most times there were empty seats and people could (and did) move around a bit once the plane was loaded and we knew the seats were empty for the flight. After taking my seat, a window seat, a couple came on board with their young son. I could overhear their conversation a couple of rows ahead of me. Apparently they had not bought their tickets in a manner that their son’s seat was with theirs. The couple took their seats and asked the other person on that row, who was already seated, if he minded switching seats so their son could sit with them. He didn’t mind, but he didn’t exactly switch seats either, instead he just sat on the next row. As you might expect, soon the person came aboard who’s seat he had taken and after a brief explanation that person also took a random different seat instead. This all continued until the plane was almost full. Literally the last person on the plane was a slightly older than middle-aged woman. I mention that not to disparage her in any way, but just to give some weight to the story. As she continued down the aisle looking for her seat, my brain started to churn a potential what-if scenario… and as fate would have it, she approached the aisle where I had the window seat, and our row was already full. She told the man in her seat that he was in fact in her seat. He asked if she minded sitting somewhere else. She was adamant, she had requested an outside-aisle seat and that was hers. A few other people around me started cluing in to the mess that was about to unravel as the flight attendant was now trying to reverse the cavalcade of randomly mis-seated people that started when the couple wanted to switch seats to have their son sit with them. I don’t remember exactly how it all settled, but I remember the couple and their son stayed together and the woman got her aisle seat on my row. I also remember a lot of people being mad at that woman. During the flight, I explained to the woman what had happened… I told her that I completely understood her wanting the seat she had specifically requested and that the other problem could have been solved in two different ways. Either that couple should have bought their tickets together in the first place or that first seat-switch should have been a literal switch rather than the cascading thing of everyone taking a random seat that trickled down eventually to her not being in hers. As it happens, she came across as a little gruff, but the truth was she requested that seat because she had difficulty getting up and down and needed the aisle seat to be able to do so comfortably. I just remember the comedy in my mind that I enjoyed first as I knew instinctively how that first seat switch might be a problem if the plane filled to capacity, and then again later as it all came to fruition and the poor flight attendant had to try and unravel it all as each thread she pulled uncovered another passenger in the wrong seat! One of this country’s best kept secrets can finally be told. General Washington became concerned that the war effort was not going well, as he received word that Great Britain was preparing to muster its fleet and send reinforcements to the war against the colonies. There was nothing that could be done, as the Revolutionists were occupied on multiple fronts already, with no way to combat a potential British onslaught from the sea. Our country might never have been born if not for timely intervention by one of history’s greatest misunderstood heroes. Seafarers had told legends of a mysterious creature that roamed the ocean floor. Washington’s last best hope was to forge an uneasy alliance with the creature, Godzilla. Most details of the alliance are lost to time, as Washington was unsure of whom he could trust to secure the alliance and so he bartered the deal himself in a secret meeting. 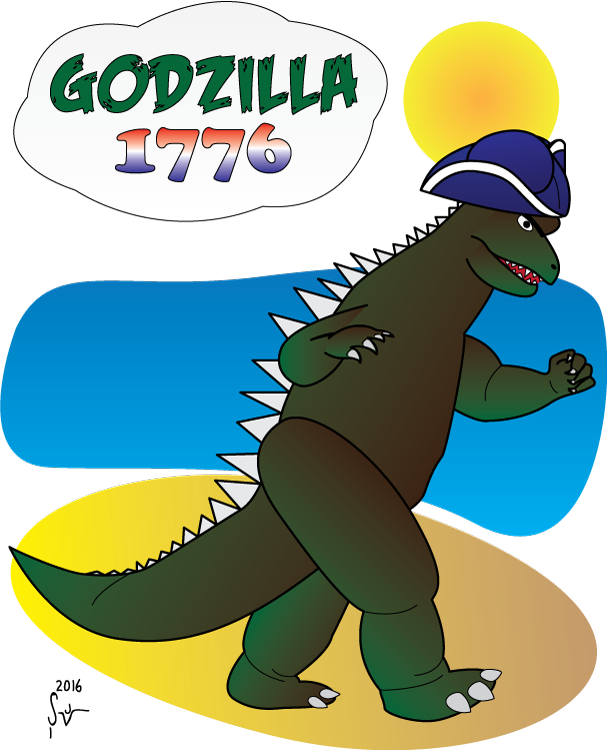 All that we know is Godzilla came through with his part to engage the British fleet in the Atlantic and kept them from joining the war effort against the colonies. Without reinforcements from their homeland, the remaining British soldiers were no match for General Washington and the Revolutionists. No one heard from or saw Godzilla again for nearly 200 years, by which time most evidence of this historically crucial secret alliance had been lost. To his credit, the creature himself made no mention of this when he resurfaced to the modern world. It is only through piecing together cryptic clues from Washington’s own diary that historians have begun to uncover the true story of the birth of our nation. Sylvester Stallone had a wonderful idea for a science-fiction story that revolved around a fictional meeting of two of history’s greatest composers, Wolfgang Amadeus Mozart and Johann Sebastian Bach. Of course it had to involve science-fiction since time-travel would be necessary for these particular historic figures to meet as their lifetimes did not overlap. It would require seeking some financial backing, and he also wanted to involve his good friend Arnold Schwarzenegger to help ensure box office success. The two actors’ agents began negotiations even as Mr Stallone began to work on the script. Big names like this working together gave the agents confidence that it was worth hammering out a deal even before seeing a treatise of the script. It turns out this was a good thing, because negotiations take a while and the script took months to hammer out as well. One day, after many months of work, Mr Stallone invited Mr Schwarzenegger over to his home for a read-through of the script. Stallone would read the part of Johann Sebastian Bach while Schwarzenegger read the part of Wolfgang Amadeus Mozart. The read-through took several hours, and many notes were made along the way but the core of the story was one they both felt strongly would work. When I was a kid we lived for about seven years in a trailer park. The streets of this particular trailer park wound themselves inside a heavily wooded area, so there was lots of forest in which to get lost and explore. You could also find lots of evidence of other people having been in and around these woods. There were lots of well traveled paths all over, and there was a trash-pile in one part of the woods not too far behind where we lived. As a kid, somehow other people’s trash is interesting. Looking back on it now, I really miss the enthusiasm I had for the simple things. On this particular day I was exploring the woods alone. Rummaging through the trash I stumbled upon some old cans of house paint. These were small cans, so I was able to carry several of them back to the area just behind my trailer to play. As I look back on this, I do not know exactly what was fun about cans of paint as I didn’t have anything with which to paint or anything upon which to apply the paint. I remember playing with the cans for a while, until I finally managed to open one. A nice teal colored paint was inside that one. Before long I had managed to get it all over my hands and arms. At this time I was not aware of having spread the paint elsewhere. I did realize soon enough, though, that I could not simply wipe off the paint and I became concerned. I did not know what to do, and I figured my parents would think me truly stupid for having gotten into the paint… so I rode my bike around the neighborhood for a while. I probably did not help myself by doing this, since it meant the paint I had on me just had more time to soak into my skin and dry. Eventually I did go home, because I couldn’t realistically stay away forever. I think they were disappointed and a little concerned, but I looked humorous enough with paint all over my hands and arms… and though I could not see it, my face as well. We then spent what seemed like hours with some rags and some gasoline rubbing the paint off of my skin. This was not fun. Once the paint was off, I then had to spend time in the shower and bath to get the gasoline off lest I trade one kind of poison for another! This was not an adventure I repeated again… but for a brief time, I was Smurftacularly blue. Remember, Papa Smurf says don’t smurf with paint or you might smurf yourself blue in the face. Even at pre-school age I had unusually free roam of the neighborhood in which we lived. Maybe it was the naivety of the 1970s, but I was without adult supervision a lot more than it seems in retrospect was probably prudent. On this particular occasion I wasn’t alone, but with a group of similarly aged friends. We were all five or six years of age, tops. I was at a neighbor’s house, maybe eight houses down the road from my house in the subdivision where we lived. So, I guess technically we were in someone’s yard and theoretically could have been observed by that kid’s parents. I do not believe that we really were given what ultimately happened. This house had one of those u-turn driveways, paved, that curved in front of the house. To the left of the house was a forest and, as I was soon to find out, a creek. Angled between the forest and the left side of the house was a bike path. On this particular day my friends and I were riding our bikes from the right side of the u-turn driveway, following that turn as it passed the front of the house, taking the sharp turn right onto the bike path, and then sliding to a stop in the dirt. I can’t actually remember why this was something we were doing or why it was fun specifically. On one of my rides I remember thinking… why do we keep turning onto the bike path? Why not just keep straight and go into the forest. There seemed to be an opening there. So, on my next ride I decided to do just that. In hindsight, I suppose I should have asked someone before blindly going forward. Pedaling as fast as I could, I didn’t take the sharp-right onto the bike path, and instead continued straight. Here is where I had my Wile E. Coyote moment. As my bike exited the paved driveway and entered the opening into the forest, I realized I was temporarily suspended in mid-air, maybe three to four feet above the surface of the water below. This was where the creek ran up to, and ultimately under, their driveway. I do not know why I did not know this previously, but in that suspended moment I could feel myself hover for what seemed like an eternity before first the bike, and then I quickly thereafter, plunged straight down into the creek. Somehow, and I do not fully understand this, the bike and I were beside each other in the creek. I’m not sure how this happened. My friends came over to help me climb out of the creek and back onto the driveway. It helped that for some reason there were boards nailed to the side of the ground that held while I climbed them. The rest of the memory is a blur. I remember being soaking wet. I remember not being hurt. I remember borrowing some clothes from my friend whose house we were all at. I remember my parents coming to get me because my bike was in the creek. I remember coming back at some point with my father and him using a shovel to fish my bike out of the creek. I don’t remember ever playing with any of those kids again. I do remember being at that house again, though, at some point in the future… and where the creek was, there was now a large pile of variously-sized boards, each with large nails protruding from them. I remember thinking how it was a good thing those were not there that time I had ridden my bike off the edge. Bob was a silly putty aficionado. If there was ever anything you wished to know about silly putty, Bob was the guy to ask. He loved everything about it, but he especially enjoyed using it to transfer comic strips and other newsprint ink to other surfaces. Sometimes he would use his silly putty to transfer a temporary tattoo to his arm. If you asked him nicely, he might transfer one to your arm as well. Bob was never without silly putty in one form or another. His favorite container was the plastic eggs that silly putty often came packaged inside, but Bob found his own ways to store silly putty too. He could keep it fresh inside a ziploc baggie, for example, so that he always had some at the ready to impress his friends or simply to amuse himself. Bob had also learned that he could store silly putty in the freezer to preserve transferred images for later use. When I was a kid, I had unusually free roam of the neighborhood in which we lived. I didn’t think about it much at the time, but whenever I reflect on my childhood I am amazed at the good fortune that bad things did not happen to me. Back then I thought things were rough, but looking back I realize I often led a charmed life. I don’t remember how old I was, but I was probably between eight and ten years old, based on things I can remember of the time. Anyway, I remember approaching the car while still straddling my bike… and when I was right beside the car, the driver reached out of his window and handed me a puppy. No sooner than I had taken the puppy in my arms, the driver rolled up the window and drove away. I had a tough time getting both the puppy and my bicycle home. My parents were not pleased. I don’t think any of us thought of the potential danger of strangers or child abduction, but rather that we already had three dogs at that time and no place in the yard for another. We kept the puppy for a few days but ultimately had to take him to a shelter. He was a good-natured puppy, and would have made a good pet if we didn’t already have too many. I sometimes wonder what happened to him. As an adult, whenever I think of this experience, I can’t help but think of all the horrible stories I have seen on the news of child abductions that began much like my story. Strangely, this is not the only non-abduction story I have from my childhood, but that will have to wait for another time. Thus ends the first installment of… A Thing That Happened!